Shachi Kurl, vice-president Angus Reid GlobalWhat? You didn’t get into the reporting business because you love statistics and debates about the makeup of a random sample? But you are committed to the importance of accuracy in reporting? An introduction to the history of polling, methodology, questionnaire design and parsing data may enhance the way you report surveys and demystify public opinion polling to your audiences. This will not be a jargon-filled hour. Instead, someone who spent the first third of her career as a journalist will share tips (with illustrative gifs!) on what you should know - and what you should be asking – when reporting on and interpreting public opinion polls. What? You didn’t get into the reporting business because you love statistics and debates about the makeup of a random sample? But you are committed to the importance of accuracy in reporting? An introduction to the history of polling, methodology, questionnaire design and parsing data may enhance the way you report surveys and demystify public opinion polling to your audiences. This will not be a jargon-filled hour. Instead, someone who spent the first third of her career as a journalist will share tips (with illustrative gifs!) on what you should know - and what you should be asking – when reporting on and interpreting public opinion polls. This event begins at 9 a.m. PT. Shachi Kurl is here to talk to us about polling this morning. 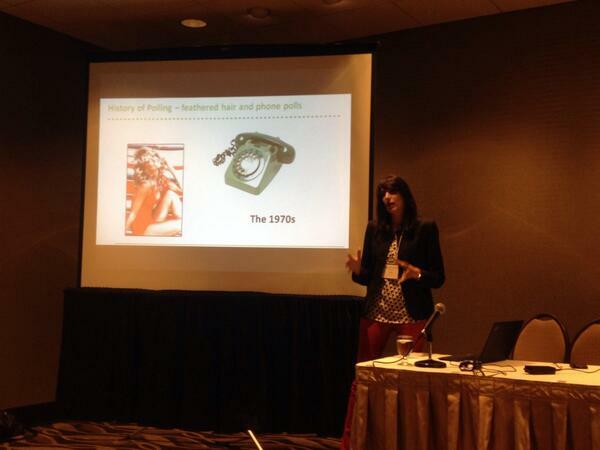 Getting ready to lead a session at #caj14 - Polling 101: What journalists should know (and ask). Eeep. I'm Nick Taylor-Vaisey, part-time liveblogger—and Karla's hired gun on this panel. We're pumped. Kurl will be giving us a good grounding in the methods, methodology and constructs of polling. I lived in Ottawa for a decade, where polling of all kinds dictates the news agenda whenever the numbers are shiny enough. Kurl works at Vision Critical. Shall the common people be free to express their basic needs and purposes, or shall they be dominated by a small ruling clique?" History of polling goes back to 1950s and 1960s when people would go door to door to poll. Kurl says old-fashioned polls that said, for example, "Nine in 10 housewives have Folger's in your cupboard," was the result of door-to-door pollsters actually asking housewives to open their cupboards. Interviewer bias was a concern of historic polling, referring to non verbal cues in a face-to-face situation and whether a person would react differently to embarrassing questions in person. Costs to do door-to-door polling were high. It was also very time consuming. Door-to-door was expensive, too (contrast that against phone polls that reach our ears much more easily). The 1970s saw the advent of phone polling. There were concerns about accuracy. There were compelling reasons to go to phone polling. It was a business decision to cut costs of door-to-door polling and you could reach people across the country much faster. The 1980s was a Golden Age for phone polling because there were good pick-up rates. People wanted to be called for polls. Computers helped further the process of phone polling because the system could be automated. Ninety per cent refusal rate for polling over the phone in the 1990s. The cost-per-complete, which was cheap in the 80s, rose in the 90s. The cost of polling fell with the computer era. Less people needed to be employed. Completion time became faster. Practices are varied when it comes to online polling. Kurl gives the crowd some Dilbert. So many different methods out there. Credibility is key. Kurl tackles the phone vs. online polling debate. Is a random sample more of an academic construct when polling? Kurl says some may argue. More and more people choose not to have landlines. Predicted by Statistics Canada that by the end of this year 1 in 4 households will not have a land line, Kurl said. Who has a landline? Not me! Is online polling the best method for polling? Maybe but not yet. Kurl points out that there are still people in Northern Canada waiting for an internet connection. All kinds of hindrances make finding a random sample difficult, regardless of methodology. Northern communities don't have widespread broadband internet (though that could change in the next few years), for example, which makes online polling in the north more difficult. If a participant agrees to do a survey is it self-selecting and not a random sample? Are the results skewed? Wording choice is one of many things that can affect a poll or survey. The order of questions can also have an impact. To correct for that divide your sample in half and ask the same questions in a different order. Kurl says many B.C. pollsters are moving to an eligible voter model or likely voter model. Loving all of the Star Wars references in this morning's #CAJ14 session on story telling @juliansher favourite movie? Yeah? Well, we have Dilbert references like you wouldn't believe in this session! Questionnaires: Preamble is important because it will the tone for how you will look at, listen to and think about the questions.